There is a fun daily photo challenge making its way around the internet this month, authors are letting everyone into their secret world. Okay, I’m not sure how secret some of it is, but we are pulling back the covers to show what goes on in our lives. 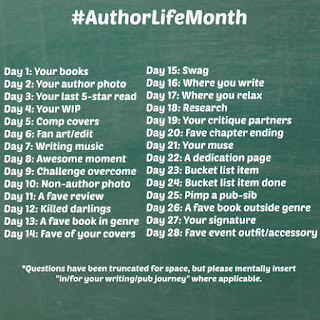 It’s called #authorlifemonth and authors from all over the world are sharing a different photo everyday letting the world into such gems as, Where I Write, My Favorite Cover, Favorite Book in My Genre, Current WIP, and so much more. I missed the first couple of days because I was sick and not doing any social media at the time, but I loved the idea and the daily challenges. So every day I have been posting my photos. It’s also been fun to search the hash tag and see what my fellow authors are doing each day. Yesterday was Where I Write, and it is great to see the desks, chairs, and couches where everyone works their magic. For me, I’ve never been one who is able to write at a desk so I posted a pic of my couch where my cat (pictured, kind of) and I write all my books. The main contest is on Instagram, but like all good hash tags it has permeated to all the platforms. 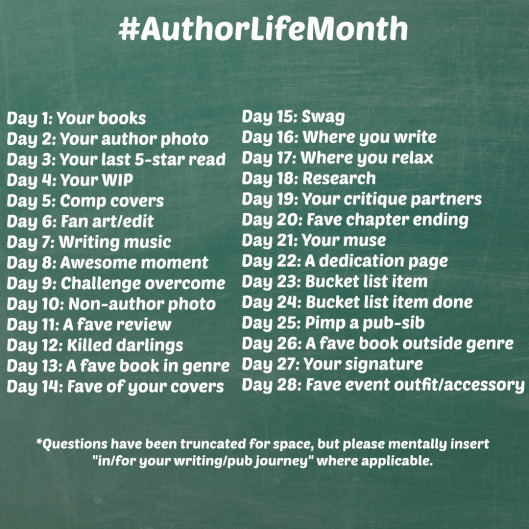 So if you’re not on Instagram, no worries, join the fun and post your daily challenge… just remember to tag each photo with #authorlifemonth so we can all enjoy. Dahlia admits she missed that this year February has 29 days, she only created 28 challenges, so feel free to do whatever you wish on the leap day. #authorlifemonth has been fun, and a great way to peer behind the covers and see the secret life of authors. It’s almost the kind of thing that Ken Burns would narrate, or you might find on NOVA. We writers tend to be a solitary lot, but if I’ve learned anything this month it’s that we are more alike than you’d expect. Thanks for sharing about it! I have to admit, in retrospect, I'm glad I missed day 29 because it means maybe I can do this again next year; turnout's been so lovely! Good point! Please do have it next year, I've had a blast. Thanks for coming up with a great idea and sharing it with all of us.